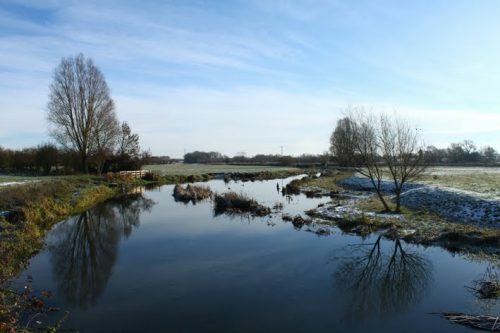 Here he gives an account of his chub and barbel fishing sessions on the rivers Great Ouse and Nene, recollecting some fantastic captures and giving some great tactical advice on targeting specimen river fish.. 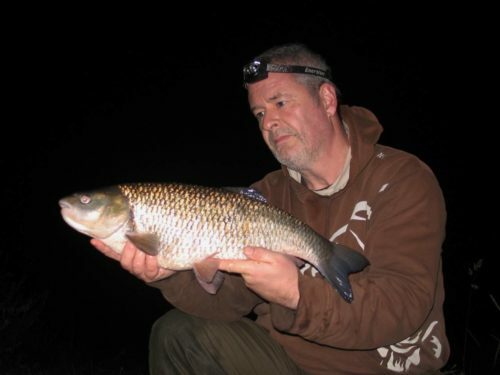 Fish like this 6lb 11.5oz Great Ouse chub helped make Tony’s season..
With my carp craving satisfied (for the time being) with the capture of my first ‘50’ in September, by the time October rolled in I was dying to get onto the rivers and have a proper go for the specimen chub on the River Great Ouse. Before concentrating on the chub though, first on the agenda was a trip to the River Nene to have a go at barbel fishing. A couple of days prior to my planned evening session there had been some heavy rain that had pushed up the river level a couple of inches and added some much needed colour. On the evening of my session it was lovely and overcast, with the air temperature staying really warm even after sunset, so things looked promising. It was a quiet start in my first-choice swim, but a quick move saw some hectic barbel action resulting in 5 barbel in 5 casts! I must have happened to drop on a pod of feeding barbel, as this was almost unprecedented action for the Nene. The largest of the five fish didn’t quite make double figures, but they all smashed the tip round in fine style (which is one of my favorite things about barbel fishing). A standard 15mm CompleX-T boilie straight out of the bag, mounted on a short hair with a PVA mesh bag of broken and crumbed boilies nicked onto the hook on each cast was the simple yet effective tactics. Having seen the tip slam round a few times thanks to the River Nene barbel and my urge to simply see some bites well and truly satisfied, it was well into October and time to switch rivers and crack on with the chub campaign. The river has suffered from a variety of predation issues over the years and while the barbel populations have taken a severe nosedive the chub didn’t seem to have suffered to anything like the same degree. However, the numbers appear to be noticeably fewer than they were a few years ago, but there were still plenty of keen anglers out fishing for them and as a result, the big fish areas saw plenty of pressure. With this mind I selected a variety of different areas to concentrate on, with a couple of the stretches being a long way from where you could park up and not having any recent ‘form’ in terms of producing a big fish. This meant that I could roam about pretty much at will, but also do a regular bit of baiting up to help wean any fish onto my chosen bait without too much chance of impacting on anyone else’s fishing. With the experience of last winter’s mega successful barbel campaign and the number of bonus chub to look back on, it didn’t take much deliberation to decide that CompleX-T was the best bait for chub. I made the effort to walk plenty of river and would sometimes visit a different stretch or two either on the way to a session, or even late at night on the way home, to drop in a handful of bait in a couple of swims as preparation for future visits. The first couple of short evening sessions produced just a couple of short taps and jerks on the tip, which I was sure were the result of chub testing the bait, but not confident enough to produce a bite that produced a hooked fish on the strike. With the river now back to being low and clear, I felt my initial presentation style was simply too crude and more refinement was called for. Although my primary target for these sessions were the chub, I wanted to give myself a reasonable chance of landing a barbel should I be fortunate enough to encounter one so I needed to incorporate line and hooks that would be strong enough to land a barbel, but with the finesse that meant I didn’t compromise on the chub action. I felt that refinement of the bait presentation itself could also help in this respect and I started to introduce an element of buoyancy, usually by incorporating a buoyant plastic artificial bait as part of the hookbait. A 12mm CompleX-T boilie tipped with a buoyant piece of plastic sweetcorn became a regular hookbait, but a number of varieties were brought into play, and CompleX-T Tuff Paste also played a greater part of the equation as time went on. With some refinement of the tackle and bait presentation made, including using the lightest quivertip that I felt was practical, I started to catch a few chub. By ringing the changes with the end tackle and presentation things started to come together quite nicely, and by the end of October I’d managed plenty of 5lb+ fish, including over half a dozen 6’s, with a best of 6lb 11.5oz. I’m pretty sure that part of the consistent success was due to the fact that I was constantly changing the stretches that I was fishing and trying to ensure that I didn’t put any one set of swims under too much pressure. After catching a decent fish or two from a particular swim or section, there was always the temptation to go back to the same swims on the next trip, but this didn’t seem to work as well as just baiting and ‘resting’ successful swims and giving them time to recover between actual fishing sessions. If I was already very happy about my results in October, then November was about to get a whole lot more exciting. It was a mild evening session towards the middle of the month, when all the hard work visiting different sessions of the river and doing a little bit of reconnaissance and baiting up really paid off. As was becoming a habit, on the way to the initial stretch, I stopped off and dropped in a handful of bait into a couple of swims that I liked the look of on a quiet stretch of river that didn’t seem to attract much attention from other anglers. It was a long walk from anywhere where you could safely park the car and the swim I liked the look of most didn’t appear as though it had been fished all season. However, after a couple of handfuls of CompleX-T had been introduced between the swims, I was soon on my way and heading off to the stretch that I intended to fish. It was starting to get dark, but things were looking hopeful once I’d eventually got to the first swim on the stretch that I planned on fishing. Recent rain had added a touch of extra colour and pace to the river and the mild conditions had me hopeful of a bite or two if I made the right choice of swims. I’d started using a coating of CompleX-T paste over my hookbait to add to the attraction and with the extra colour in the water I decided to add an additional dollop of paste around the lead as well to help any fish in close proximity home in on the area of my hookbait. Fortunately, my initial choice of swim appeared to be a good one, as it didn’t take too long to get the first bite. A proper thump around saw me connected to a heavy, hard fighting fish, which after a few seconds I realized wasn’t an absolute monster of a chub, but a very welcome barbel. Once I’d managed to coax it into the net I could see in the beam of my headtorch that it was a possible double and the scales showed that my estimate was a good one by spinning round to 10lb 11oz. A few quick self-takes later and I was cast back out in the same area, but unfortunately hopes of further action were quickly dampened as an otter appeared and made quite a bit of disturbance in the area, before finally swimming off upstream. 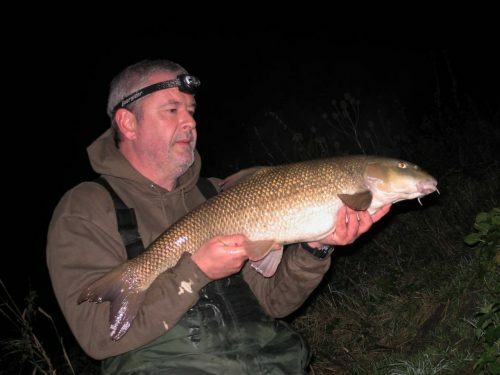 This double-figure barbel was a rare but welcomed surprise for Tony on the Ouse. Following the otter disturbance i decided to change stretches all together and headed off to the other stretch where I had been baiting up. Once I’d got myself to the new stretch I was eager to get installed into the swim that I really fancied, the most overgrown one that looked as though it hadn’t been fished in ages. I was using my standard 12mm CompleX-T boilie tipped with a piece of plastic corn as a hookbait, but again I decided to wrap both the hookbait and lead with paste on each cast. Both my faith in the neglected swim and my chosen tactics seemed to have worked, as quite a gentle bite, not too long after casting out found me attached to a very heavy fish. Suddenly the hooked fish appeared to wake up and made an unstoppable run downstream, dragging over 20 yards of line, seemingly without effort, off a clutch that was set to only give line with the rod bent well past its standard test curve. Alarmed at how far downstream the fish had got on its initial run, I applied even more resistance to the spool with my left hand and managed to stop and turn what was obviously another barbel. With the fish pointed back up towards me it fortunately decided it had had enough of the dramatic runs and instead used its weight and just slow, ponderous movements to desist my efforts to work it back upstream. However, inch by inch I was making painstaking progress and the big barbel was slowly being maneuvered back towards me until it appeared to become wedged behind a bit of weed or some old reed stems or something about 10 yards or so downstream of the swim. I had no choice but to plough through a load of brambles and nettles in the dark and get a position downstream of where the fish was stuck and attempt to haul it back into open water. Thankfully this got the fish moving again and after a few more minutes of dogged scrap I was able to work it further upstream and finally drag it into the landing net. Once both the fish and I had had a few minutes to recover from the fight I made everything ready and got on with the business of weighing the barbel. This was the first chance I’d got to have a good look at it, and already knowing that it was a proper big fish I was pleasantly surprised to see that it was in really good condition, with only a couple of old nicks in the dorsal fin and a slight red mark on one side towards the tail. 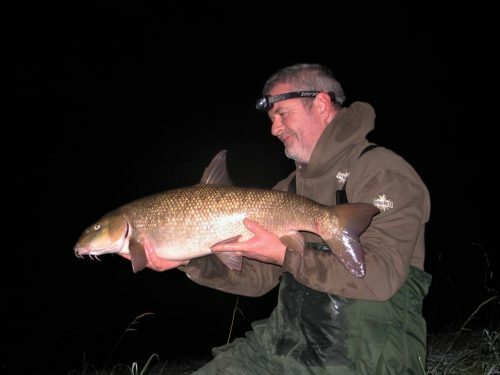 With the scales registering 15lb 15oz, which was the heaviest barbel I’d heard of from the river that year, I was over the moon with my results that evening. I would have liked to have called someone out to do the photos of such a significant fish, but in an effort to keep quiet about the location I settled for a handful of self-takes before releasing the magnificent beast back to her home. 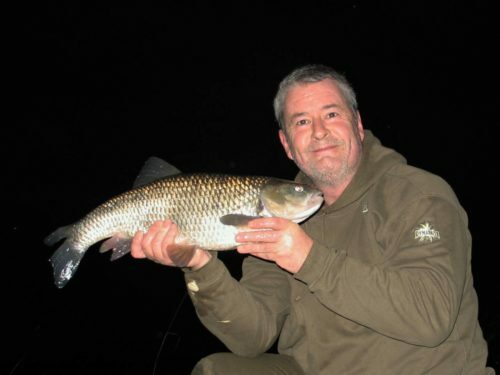 Tony’s huge 15lb 15oz barbel was tempted on a 12mm CompleX-T boilie tipped with fake corn.. The good times on the river didn’t stop with the huge barbel either, as during the same spell of mild settled weather I maximized my efforts to get to the river as much as possible, which resulted in several more good chub topped by another couple of 6lb+ fish, including a season’s best of 6lb 13oz. However, towards the end of November the rain was having more of an impact and with the ground now becoming much damper, each decent spell of rain threatened to bring the river up and therefore not quite as suitable for the big chub as it had been earlier in the year. Faced with uncertain weather over the colder winter months I thought it best to come up with a Plan B for whenever the river was ‘out of sorts’. I’ll let you know how things turned out in my next update.